build it and you install it! provide, however sometimes not exactly what you had in mind. This is why we’ve launched our DIY program. producing all the custom concrete pieces yourself. your home. Don’t forget the clean-up! aspects to allow an exciting experience for you to design and build your own custom piece. As long we help you reach the goal for YOUR ultimate concrete creation, it doesn’t matter how involved we are. and contractor assistance you find appealing to your needs. 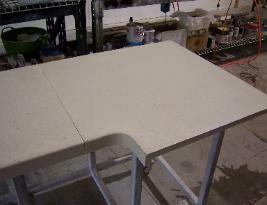 on how to make custom concrete counter tops. you can take home with you to install. professional to assist you further. process and knowledge of product to save money. There's no buying our mix, we show you how to make it. the professional quality done by our shop. So we've decided that will help you do it yourself. You can be as involved in the process as you prefer.